Shout out to Liquid Matte lovers! 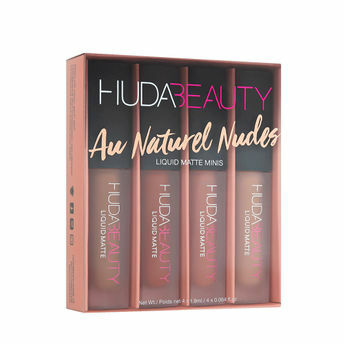 Your all-time favorite Huda Beauty liquid lipsticks are now available in mini versions! 4 crave-worthy minis gathered in gorgeous monochromatic collections specifically curated to fit your latest obsession! About the Brand: Huda Kattan is one of the most internationally recognized makeup gurus and content-creators. She is an award-winning makeup artist, blogger and vlogger. Guided by her expertise and eye-for-detail, Huda Kattan founded her record-breaking global brand Huda Beauty in 2013. Since then, Huda Beauty has become the No.1 Beauty Instagram account with over 20 million followers. Kattan is constantly creating ground-breaking products as she continues to build and reinvent the beauty empire.